Cruises from Buenos Aires depart from fall through spring. Argentina's capital is a stylish city filled with tango clubs, flea markets and great restaurants. A city tour is the best way to see the attractions, including the old Italian district of La Boca and the artists' quarter of San Telmo. 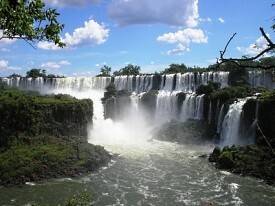 Other options include a flightseeing excursion to Iguassu Falls and a visit to a working ranch. The Port of Buenos Aires is located approximately 1/2 mile from downtown and 25 miles from the Buenos Aires International Airport. Travel time between the airport and the pier is approximately 45 minutes to an hour. Taxi fare is approximately US $45, including tolls. Rates are subject to change.